One of the most important financial decisions people make is whether to go to college. The price tag of a college education is rising, but so are the benefits. In this lesson, students will begin by learning the relationship between level of education and the average unemployment rate; and level of education and median weekly income. Students then learn about wage premiums and investigate the various college options available to them; financing options available to them; the importance of filling out the Free Application for Federal Student Aid (FAFSA); and finally, college as an investment in human capital, examine the costs and benefits, and decide whether it is a good choice. One of the most important financial decisions people make is whether to go to college. The price tag of a college education is rising, but so are the benefits. In this lesson, students will begin by learning the relationship between level of education and the average unemployment rate; and level of education and median weekly income. Students then learn about wage premiums and investigate the various college options available to them; financing options for college; the importance of filling out the Free Application for Federal Student Aid (FAFSA); and finally, college as an investment in human capital, examine the costs and benefits, and decide whether it is a good choice. Analyze the costs and benefits of investment in human capital. Describe the relationship between level of education and average unemployment rate. Describe the relationship between level of education and income-earning potential. Investigate the various college options available to them. Explain the difference between a loan and a grant. Explain the difference between a subsidized and unsubsidized loan. Explain the importance of filling out the FAFSA on time. Human Capital Concept Video: An Econedlink Video. Federal Reserve Economic Data (FRED): a graph showing the average unemployment rate for college graduates and high school graduates. Earnings and Unemployment Rates by Education al Attainment: Data from the Bureau of Labor Statistics (BLS) on level of education and median weekly income. Majors That Pay You Back: Information regarding the college wage premium. College Navigator: A research tool for finding degree programs, schools and general information on institutions. National Occupational Emploment and Wage Estimates: Information about occupations and annual average wages from the Bureau of Labor Statistics. BLS K12: Teacher and student resources about the Bureau of Labor Statistics. Is a College Cap and Gown a Financial Ball and Chain? : A Liber8 essay. PACED Decision Making Grid: Students will use this worksheet to help them make a decision. 1. Ask the students if they are planning to go to college. What are the costs and benefits of college? Define cost/benefit analysis as the process of examining the advantages (benefits) and disadvantages (costs) of each available alternative in arriving at a decision. Tell the students they may have heard that the price tag of a college education keeps climbing higher every year. In fact, the price of a college education is climbing at a faster rate than the average price level of other goods and services. So, they may ask whether a college education is really worth the price. In other words, do the costs outweigh the benefits? 2. Tell the students that economists see a college education as an investment in human capital. Define human capital as the knowledge and skills that people obtain through education, experience, and training. Investment requires a person to pay for something now with the expectation that they will reap benefits in the future that make the investment worthwhile. In the case of a financial investment, this might mean buying stocks or bonds now with the hopes that the dividends, interest, and capital gains from the sale of the stock or bond, compensate for the risk that the asset might lose value. A business invests when they buy a piece of equipment or new technology with the expectation that the new equipment will increase the productivity of the business and increase profits in the future. In each of these cases, there is an up-front investment, with the hopes of higher income in the future. 3. Investing in higher education is similar. It is an investment with the expectation that a higher future income will compensate the investor — the student in this case — for their risk. In the case of higher education, the economic benefits are many. 6. Tell the students that the financial return on investment in education is often described by economists as a wage premium, and is calculated as the ratio of the median wage of those with a bachelor’s degree to the wage of those who have only completed high school. Over time the premium has risen, from a 40 percent premium in the late 1970s and early 1980s to about 80 percent in more recent times. This means that a current college graduate will earn, on average, about 80 percent more than those with only a high school diploma. It is important to realize that 80 percent is an average, and that different college majors have different return on investment. For example, engineering majors have the highest four-year premium at 125 percent, while psychology and social work majors have the lowest premium at 40 percent. 7. Tell the students that there are many ways students pay college. Saving for college by students and parents should be part of the equation, but often it is not enough. Part of considering the costs of college is applying for financial aid. The Free Application of Federal Student Aid (known as FAFSA) is used to determine eligibility for student financial aid including grants, loans, and work study. In fact it is used to help determine eligibility not only for Federal programs, but for state aid and institutional (college or university- level) aid. The U.S. Department of Education begins accepting applications beginning January 1 of each year. 8. Click the link below to watch the Saving for College video, and then answer the questions below. · People often pay for college using a combination of pre-funding, current funding, and post-funding. Explain each below. 9. Remind students that there are a variety of education options available to them, including four-year public and private universities and colleges, and two-year community and technical colleges. Students can reduce the financial cost of college by attending a local two-year community college and then transferring to a four-year institution, living at home to save on living expenses, or paying for college while they are working. 10. Instruct students to compare tuition, fees, and estimated students expenses among community college, public four-year college/university, and private college/university. Instruct students to click the link to the college navigator (nces.ed.gov/collegenavigator/ ) and follow the directions in the lesson. Tell the students to write a short summary of the difference in college costs among the various types of institutions. 11. Tell the students that when thinking of investment, students should be mindful of the relationship between the value invested and the expected future income. So, attending an extremely expensive university which results in high levels of debt for a degree with a low wage premium may not be wise. It might be wise to attend a community college or state university to pursue that degree. On the other hand, attending a more expensive private university to earn a degree with a high wage premium might justify a higher level of debt. A common “rule of thumb” is that students should not borrow more than the first year average salary of people in that occupation. Using this guideline would mean that students would be justified in taking more debt to pursue a degree in engineering than in social work. Note that the rule of thumb is for starting wages and data provided is annual mean (average) wage. Remind the students that one of the most important personal finance lessons they will make will be the decision regarding their education. The price of college has been rising, but so have the benefits. Students should consider the differences in costs of various types of college and universities, and the differences in income levels associated with different majors. One way to reduce the price of college is by applying for financial aid using the FAFSA form. Thinking about these decisions now can have a huge payoff in the future. Discuss what you occupation you would like pursue. Investigate what type of education and training will prepare you for that occupation. Discuss what colleges or universities you would like to attend. Discuss how you will pay for college. 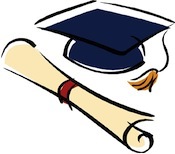 Have students read, "Is a College Cap and Gown a Financial Ball and Chain? "and answer the questions that follow. 4. In the end, is a college education a good investment? Write a detailed response using data to support your answer.